Though the main component of your help is through your financial contribution to the school, you also get to get your hands dirty during our dedicated volunteer day. The type of work will be dependent on the school’s progress and current conditions. During the trek, we may be able to help with other community needs if time and conditions permit. Please note that there are certain hazards that come with construction. Protect yourself by wearing high ankle boots while volunteering, use your sunglasses as eye protection, and wear the work gloves and dust masks that we provide. Before starting the volunteer work, your Trip Leader will give a safety briefing highlighting the potential hazards on site. What does teahouse trekking look like? The fun doesn’t end when we stop hiking. There will be down time while food is being prepared, after meals, and in the mornings before departure. We will be providing yoga mats for some much-needed stretching, but how you choose to spend your time in the lodges is up to you! Feel free to bring games, instruments, hobbies, speakers, etc. to share with your fellow trekkers and staff. And who knows, perhaps the people who will enjoy the entertainment the most will be the locals! Our excellent team of local trekking professionals will be supporting us on the trail and working alongside us at our project sites. Each group will have an English speaking guide to lead the way and answer any questions you may have, and porters will be carrying personal items from teahouse to teahouse. In Kathmandu, you will be staying at the lovely International Guest House. On the trek, you will be sleeping in rustic Nepali teahouses. The rooms are clean, basic and generally double occupancy. Be prepared for the possibility of eastern squat toilets and no hot showers on the trail. We discourage generating baby wipes waste, so please bring washcloths or handkerchiefs and our staff will be providing you with washing bins and warm water. On treks in Nepal, it is customary to eat breakfast and dinner where you are lodging. 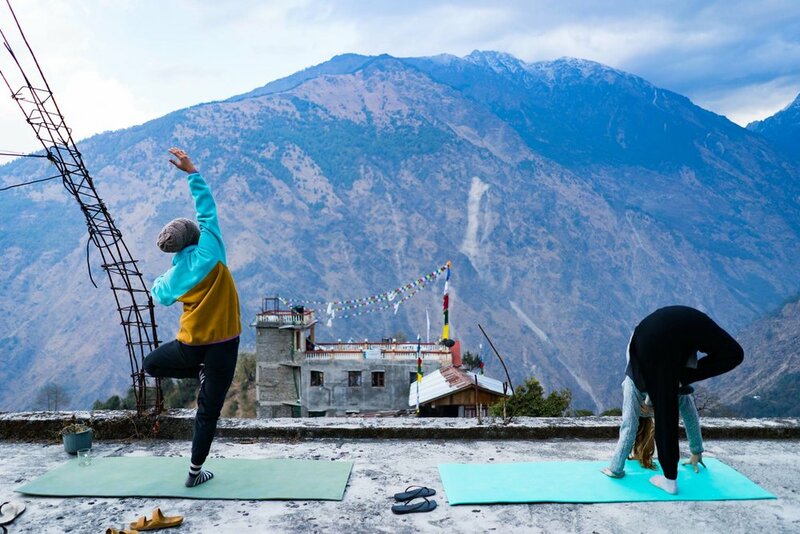 Langtang Valley is populated by Tibetan Buddhists, so once you’re on the trail expect 3 hearty vegetarian meals a day. The staple diet of Nepal is dal bhaat, or lentils and rice with a side of vegetables. Momos (handmade dumplings) are a local favorite. If you have any special dietary restrictions or allergies, please be sure to indicate them on our volunteer application form. Though all food is covered on the trip, we encourage you to bring snacks and comfort foods from home for variety. 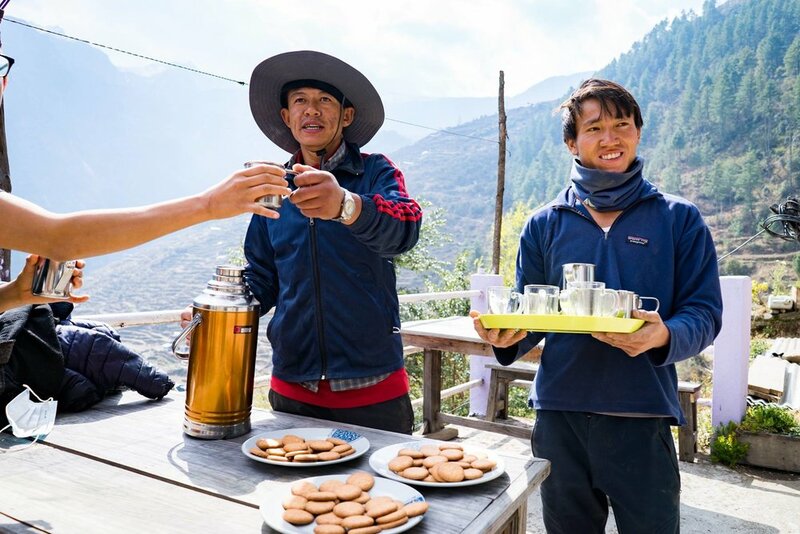 As a service to our guests, our staff will be providing safe, treated Himalayan water at the lodges. Remember to leave your bottles at the dining table to be refilled! On the trail there are limited opportunities to charge batteries, so bringing a headlamp/flashlight, extra camera batteries and a backup battery bank will be useful. Laundry services are available in Kathmandu, but on the trail it is inconvenient to wash clothes. We recommend reusing bags to separate clean from dirty clothes until your return to Kathmandu. 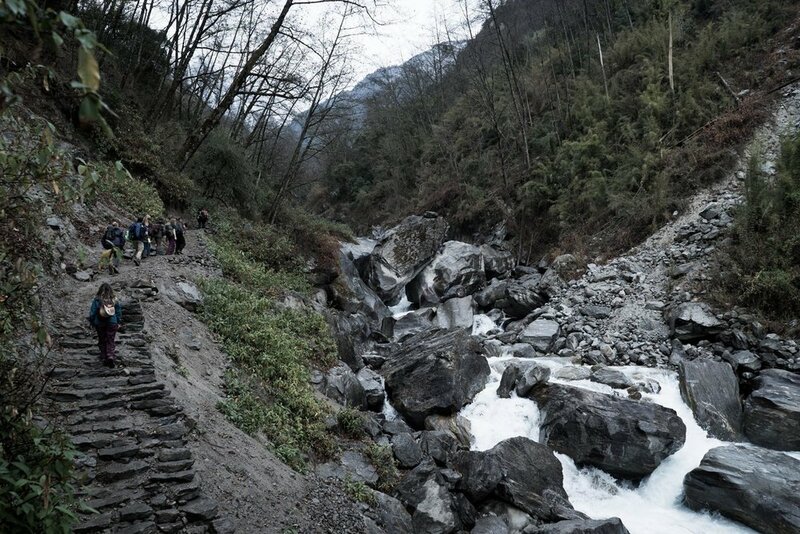 The trail starts in Syabrubesi and follows the Langtang Khola (river) all the way to our final destination, scenic Kyanjin Gumba where we spend 2 nights. It takes 3 days to hike up through the forested canyon and into the broad Himalayan valley, 1 day to summit the optional Kyanjin Ri peak, and 2 days to return following the same scenic path. Langur monkeys, yaks, and zopkios (yak and cow hybrids) are common sightings, as are many traditional chortens and mani walls dotting the path. Every few hours you will pass a settlement, populated by newly reconstructed homes and teahouses. An optional half day hike up Kyanjin Ri peak (4779m) from Kyanjin Gumba will give you rewarding panoramic views. The 2015 earthquake’s effects are evidenced throughout the trek by various landslides, which makes the trail rocky and uneven at times. The path crosses an unimaginably massive landslide which marks the grave of Langtang Village, which used to be the largest settlement in the valley. 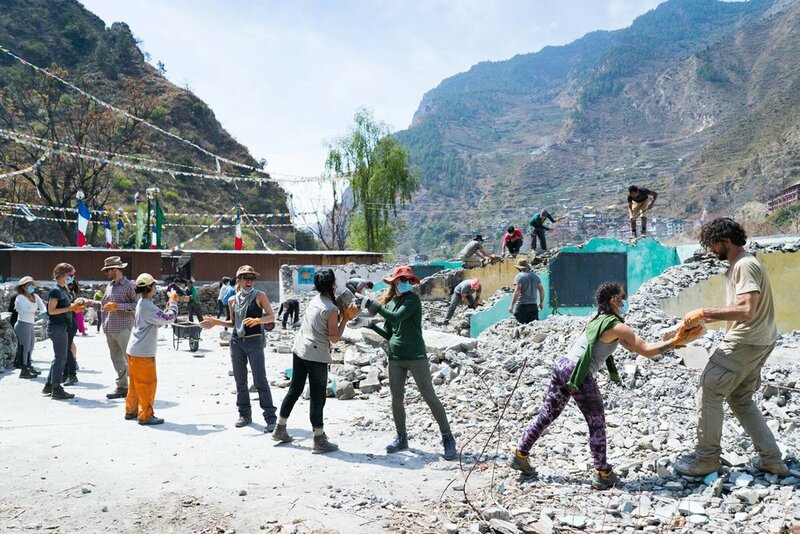 Read a multi-perspective account of Langtang’s tragic earthquake story here. Are you equipped and ready for trail? Because we will be gaining 3,200 meters in elevation during the trek, weather will vary drastically. Be prepared for all conditions - hot, cold, wind, rain, snow, hail, and bright sun. 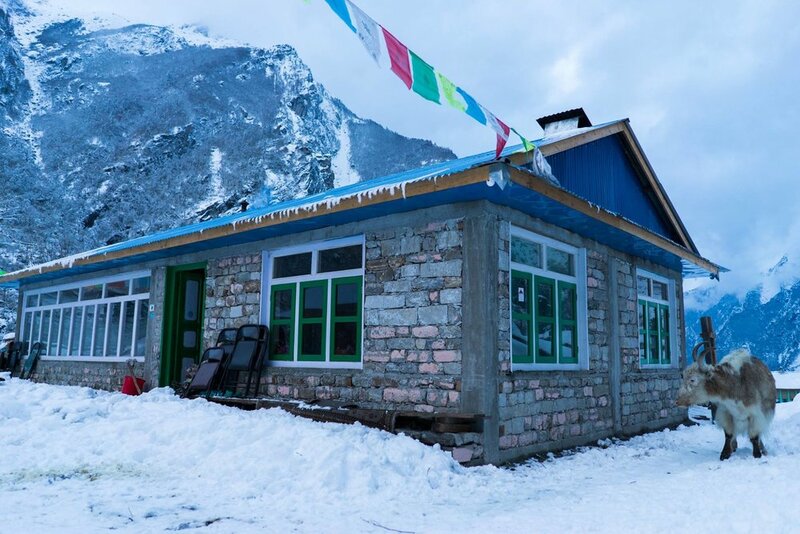 Check out the detailed weather conditions of Langtang Village (near the top of the trek) here. We are providing a 55 liter trail duffel bag, sleeping bag and liner, and down jacket for use on the trail. These borrowed items will be distributed to you at our pre-trek briefing the day before departure. Please note that participants are liable for any damages to lent gear. When packing for the trail, please consider that a porter will be carrying the trail duffels of two people at a maximum load of 25 kg. The porters will pick up your duffel bag from your room each morning and deliver it to the day’s destination. Do not expect to have access to your duffel until you reach the lodge at the end of the day. During the day, you’ll be carrying your own daypack which should have all the Himalayan trail essentials: rain jacket/poncho, fleece top, sun hat and sunglasses, and water bottle/thermos. If you are traveling with extra luggage that you won’t need for the trek, you can leave it at the hotel in Kathmandu free of charge. Regarding clothing, think conservative. Bare shoulders and knees, especially in rural mountain villages, are culturally inappropriate and should be avoided. Prepare yourself for walking 5-7 hours a day on the trek. Many people begin moderately fit and end the trek feeling amazingly healthy. To maximize your enjoyment on the trip, plan an exercise program that trains you for endurance hikes well in advance before you go. Brisk walks are a good start, building up to include long walks up and down hills while wearing your hiking boots. Carrying a weighted pack will help you get stronger. Whenever possible, take the stairs to train for ascents/descents, and seek out exercise programs that build up your cardio. The best way to prepare for altitude is to go to elevation - if possible, within 2 weeks prior to your trek spend at least a night or two somewhere 3,000m or above to acclimate. A single entry visa for 15/30/90 days costs $25/40/100, and visa on arrival is available at the airport. Cash in USD is preferred, and a 2X2 photo will come in handy if the automated kiosks are malfunctioning. There are no official immunization requirements, but you can check out the Travel Health Clinic’s vaccination recommendations for Nepal here. Altitude sickness becomes a concern above 2,800m and is characterized by a headache, feeling breathless on exertion, loss of appetite, nausea, difficulty in sleeping, dry cough, and/or general fatigue. The first line of defense against altitude sickness is to ascend slowly and drink plenty of water. One drug known to prevent and treat AMS is Acetazolamide (Diamox), which can be purchased in Kathmandu - consult your doctor to see if this medication is suitable for you. Individuals with sulfa allergies should not use this and may consider natural alternatives such as ginkgo biloba or chlorophyll tablets. However, if symptoms persist or get worse, you must descend. 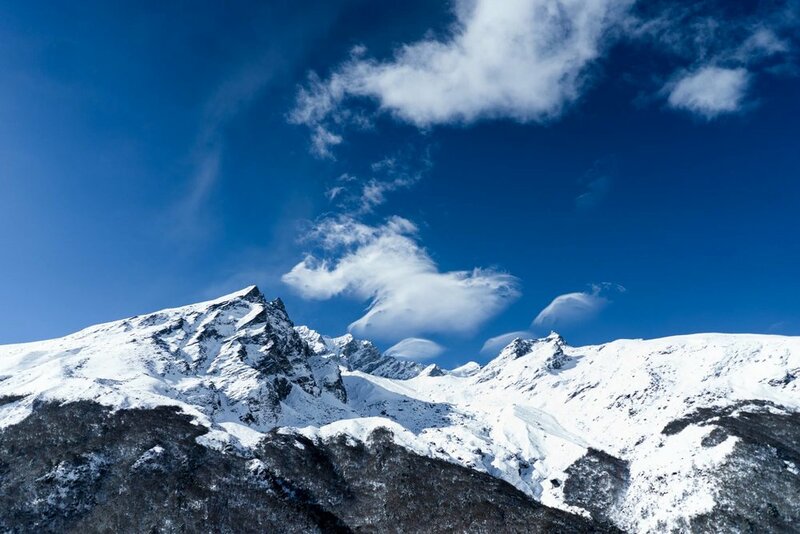 To learn more about altitude sickness and prevention, click here. 1 USD is around 100 Nepalese Rupees (NRS). ATMs and money changers can be found right outside the airport and around our Kathmandu base. There will not be any opportunity to take out or exchange money on the trail. Trek Relief does not cover tips. If you appreciate the services provided by our guiding staff, please consider tipping them and allocating enough funds before departing from Kathmandu. As a guideline, the suggested amount per participant for the 10-day trip is $100, to be divided among the staff. Generally, the guide receives 25-30% of the total and will be collecting the tips on our last night of the trek.